Still vaguely publike but food is overwhelmingly the priority. There's another branch of the same outfit by Chelsea FC. Uncertain if Young's still own the place. New licensee Gus, apparently a Kiwi, hopefully will do as well as fellow countryman the excellent Tom Kavanaugh did ten years ago. Massive change for the better. I love this pub now. Brilliant burger. Changing yet again soon by the sounds of it. 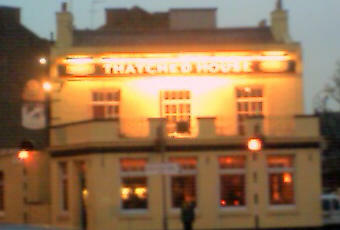 I'm taking over the Thatched House in Ravenscourt Park with @philwhite101. We'll be sorting it in March and opening it new in early April. Will anyone ever get it right? Or loads more money thrown down the drain? Here's a suggestion: it's a pub. So treat it like a pub. 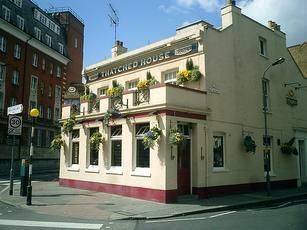 The gastropub era is drawing to a close, thank goodness, having done huge amounts of damage to pubs across London. I am a local and have been using this pub for years - but no longer. It describes itself as 'child friendly', which it has been until tonight, when myself and a friend and our three children were treated appallingly by the incredibly rude landlord. We went for a quick drink at 6pm, and we didn't feel welcome at all. The children were playing nicely at the table, and he kept coming over to say 'we had to keep the children with us at all times' - continuing dirty looks from the bar staff. I will advise all my friends with children - and they are a lot of us - not to use this establishment again. Great food, great atmosphere, cosy fireplace. Spend the whole of boxing day here with the family, best Xmas we ever had. Tried everything on the menu, loved it all!!! !